Source: Elisabet Ollé personal observation. Juigalpa is the capital city of the Chontales Department of Nicaragua. Information about the city at wikipedia.org. 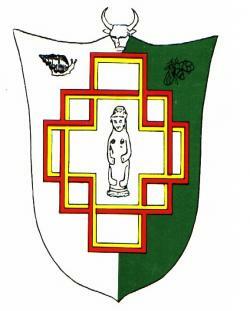 The flag is reported at alcaldiajuigalpa.gob.ni with information in Spanish. Shows: Four small black snails : Etymology of the word Juigalpán, "rich in small black snails". The four small black snails move eastwards, towards the origin of light. - Psychological: The promising color of hope is green." 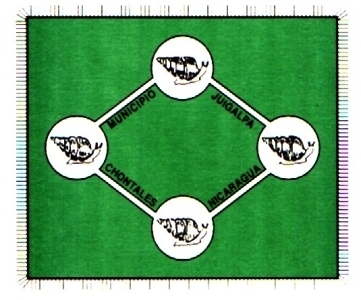 The name "Municipio of Juigalpa, Chontales Nicaragua" that is written on the flag of new version.